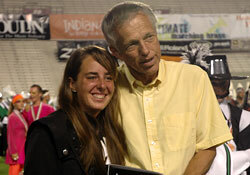 Meghan Huber, drum major for the Crossmen, was named the 2008 World Class recipient of the Jim Jones Leadership Award, recognized during this year's DCI World Championship Finals in Bloomington, Ind. "Winning the award this season was such an honor," says the 21-year-old Huber, who was a baritone player for the Jersey Surf from 2002 to 2005 before joining the Crossmen in 2006. "This summer was very successful for the Crossmen because of the members' hard work and dedication to improvement on and off the field. Everything I learned about leadership has come from the advice and inspiration from the members and staff of the corps, and for that I'm extremely thankful." Huber, a native of Linwood, N.J., is in her senior year at Rutgers University, where she's a Dean's List student in biomedical engineering. She says she's looking forward to leading the Crossmen again next season. "The most impacting lesson I learned this season from being drum major was to never lose sight of my goals," she said. "Everyone has challenges and triumphs. It's what you learn while experiencing them that affects who you are as a person in the long run." With the 2008 reorganization of the old Divisions II & III into Open Class, this was also the first year that Drum Corps International additionally recognized a second drum major with the annual award. Eighteen-year-old Velvet Knights drum major Blair Lezcano is the inaugural Open Class Jim Jones Leadership Award recipient. "It's quite an honor," says the Orange, Calif. native, who's currently a freshman at Santiago Community College. "It was a little unexpected. I was just doing my job as drum major and here it came!" "Blair is a very intelligent young man for his age," says Velvet Knights director Myra Iraheta. "He's funny and he's serious when he needs to be. 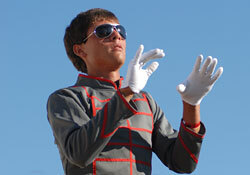 I've been very, very proud of him as I've watched him grow into his role as drum major." Selections for the annual award — named for the late Jim Jones, one of Drum Corps International's founding directors and a charter member of the DCI Hall of Fame — are made by a committee of Hall of Fame members. View past recipients of the Jim Jones Leadership Award. Reprinted from the Fall 2008 issue of Drum Corps International Magazine.